With more than 80% of the data gathered being unstructured and unusable, companies are leaving a lot of value on the table. To recover that value, they have to be able to make sense out of massive amounts of unorganized information, and so companies are turning to artificial intelligence to help separate the valuable data from the noise. With AI and machine learning, companies are able to turn their previously unusable data scraps into valuable business intelligence – things like creating new smart inventory controls and demand signals, applying natural language understanding to customer interactions, and aggregating sales and marketing data to create better forecasts and happier customers. 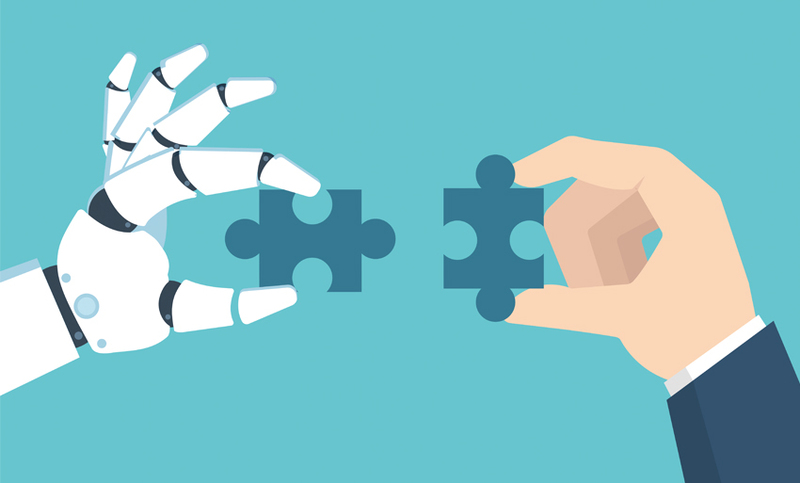 One business process that is particularly well suited for AI in its current form is customer service and CRM, specifically by using human assisted AI. Chatbots and other self-service technologies have serious potential to massively change how companies and customers interact with each other, in a way that is both cost effective and mutually beneficial. In general, human assisted AI refers to prescreening communications with an AI in hopes of either 1) taking immediate, automated action or 2) providing a human agent with the necessary information to make a quick and accurate decision. Human assisted AI for customer service is built off the same basic principles as other AI you may be familiar with – meaning it ‘reads’, analyses, and classifies text according to rules and past experience – only in this case it works in tandem with a human. The main difference is that the AI can be empowered to take action and send out a response if it reaches a certain degree of confidence, and if it doesn’t, then the message is passed along to a human with a suggestion on how to respond and tools to make the best possible decision. This process speeds up problem identification and allows employees to respond faster and more accurately. See an example of how human assisted AI for chatbots works here. This method not only frees up customer service reps to tackle more complicated customer issues that may create more loyalty if addressed, but it also exposes the AI to a wide range of scenarios that help to improve its capabilities . Even one bad customer service experience is enough to lose a customer forever. Over time, as employees become more familiar with the tools and the AI encounters more and more data, companies will be able to optimize their CRM to handle increasingly large volumes, take pre-emptive action, and provide highly individualized support. It’s no secret that customer service is big business. Billions are made and lost every year based on how well companies interact with their customers. Human assisted AI can do more for your business than save a couple minutes here and there, it can drastically affect your bottom line by increasing customer satisfaction, loyalty, and ultimately sales. The pushback on this subject is generally around cost. AI sounds fancy and expensive and hard to implement. That doesn’t have to be true, especially when it comes to customer service and human assisted AI. The bulk of the cost will be for development and implementation, which are relatively low given that the solution is essentially pre-made and need only be customized for a company’s particular business processes. After that, the operational costs are drastically lower than a fully human-powered call center: the average cost of a live service interaction [phone, e-mail, or webchat] is more than $7 for a B2C company and more than $13 for a B2B company, while the cost of customer interactions through self-service and human-assisted AI services are measured in pennies. It’s hard to make a claim for actual total savings, but companies that have implemented these types of solutions report anywhere from 60 – 80% savings over their old customer service process. One important thing to note is that the success of a human assisted AI solution really depends on the ability of developers to properly model conversations and responses. To ensure the best results, input should be sought from any and all stakeholders, that includes product managers, tech teams, salespeople, executive leadership, and of course, the people at the front line, customer service reps.
Human assisted AI is not some futuristic-dystopian-cyborg invention, it is a completely feasible, cost-effective, and seemingly all-around better way to do customer service. In reality, it’s nothing more than an additional tool for customer service reps to improve their service and better engage customers. Additionally, while the AI works away at the simple and repetitive issues that make up a majority of customer complaints, human reps are free to address the more complicated complaints that require a human touch. The best part about it, unlike many lofty AI solutions being proposed, human assisted AI is ready-to-go today. What does the future hold for Human Assisted AI? According to IBM, 85% of customer interactions will be handled without a human agent by 2020. Gartner predicts that $2.9 trillion will be spend on AI opportunities. This may sound scary to robot-takeover types, but here is something to remember: the robots aren’t being paid. The trillions of dollars that are going to be spent on AI won’t be going to the computers. It will be going to [very much human] developers, IT maintenance, designers, managers, and of course customer service reps. Reps who, by the way, will very likely be much more effective and able to handle increasingly complex complaints, creating value for the company but also making reps experienced with AI increasingly valuable talents. Humans and AI together are the perfect way to supercharge your customer service. The future for AI is bright, but the future for human assisted AI in customer service is here.